On Saturday, I mentioned that I was molding some chocolate as part of a gift Jeff was doing for his team at work. 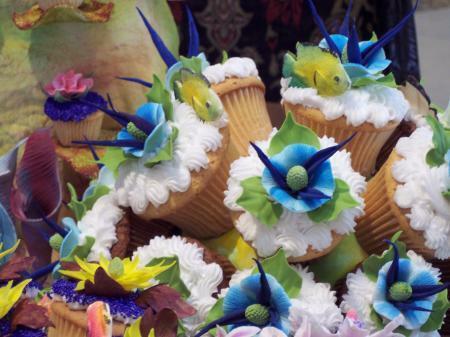 I offered to do this in white chocolate so we could color it, but we opted to go with an easier approach. After tempering the Scharffen Berger chocolate we got from Whole Foods, I started in on the individual molds - here is the outcome... Chocolate Suckers! The next item to bring in was a recipe I saw in a recent Taste of Home Holiday magazine. 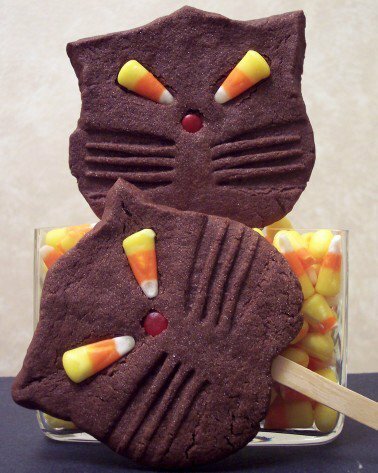 Black Cat Cookies have a deep chocolate cookie base from dutch cocoa and are shaped into kitty faces. The dough was pretty easy to work with and placing the wooden sticks in before baking made things much easier. 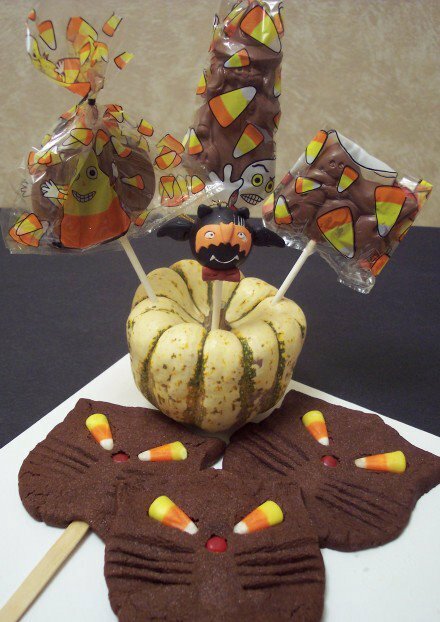 Candy corn, red hots, and a fork impression (whiskers!) make up these cookies. This is how we ended up finishing everything off to give out. Okay... so on to tonight's dinner! Roasted Cauliflower with Fresh Herbs and Parmesan served along side Turkey-Sausage Paella is what I made while we waited for the trick or treaters to start knockin'. Another use for the saffron we bought awhile ago. I increased the chorizo from the original recipe as 2 oz seemed to skimpy for 4 servings. This has quite a few flavors going on and it turned out very well. I used edamame instead of the peas, as that is not something we normally keep on hand. Using smoked paprika is key here as it brings a rich smokey flavor that accents the spice from the sausage. 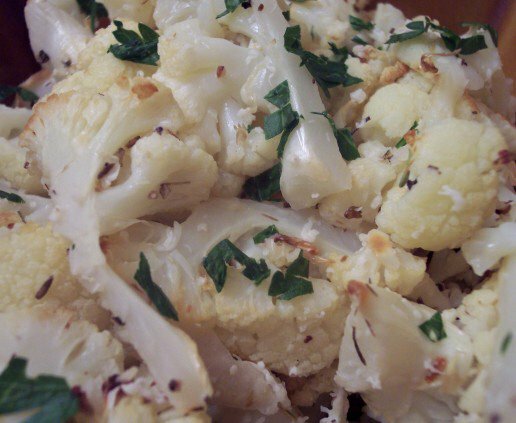 The roasted cauliflower was a great side dish. From a quick prep and then a high heat roasting the taste seems to change as the outside gets a caramalized finish. The fresh herbs and lemon juice helps bring out a fresh vibrant flavor. 10 new recipes this past week. The stand-outs for us were the Lasagna Rolls,"S" cookies and the Tassies. You can find all the recipes from this last week, along with the rest that we have done, on the left side bar. 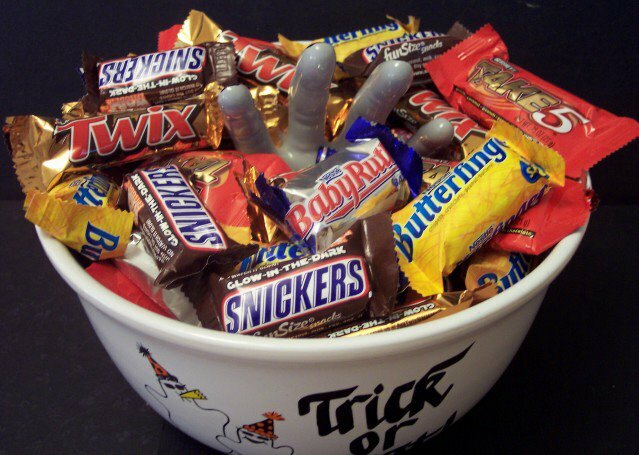 Tomorrow is Halloween! 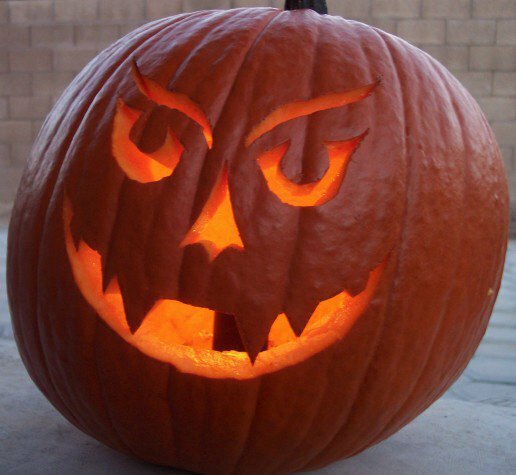 Jeff did a pumpkin yesterday... we did save the seeds to do something with, but have not decided what yet! Here is the final result. I'm going to be finishing up what Jeff will be bringing to his team tomorrow after I finish lunch today. Check back tomorrow to see the finished pictures - today it is a fun cookie to add along! Hopefully we will still have time to get our Netflix movie in tonight. The Hitchhiker's Guide to the Galaxy is one I have been waiting to come out on DVD. I'm surprised we got it this soon! Another busy week in the kitchen coming up - stay tuned and see what comes out next! I spent sometime in the kitchen this morning playing with almost 2 pounds of chocolate. 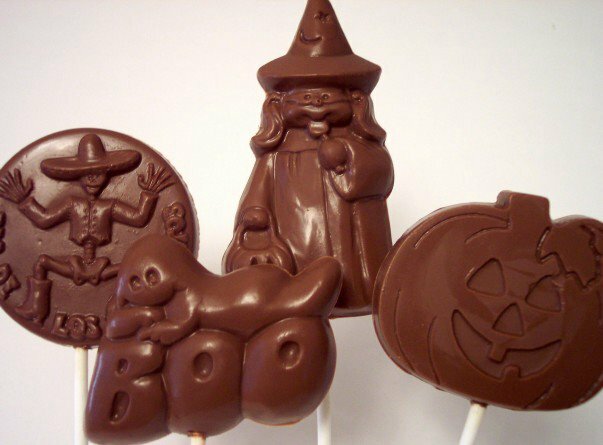 I can't say what yet (I was tempering/molding it...) but they are for Jeff's team for Halloween gifts on Monday. Pictures to follow on that day in case they try and peak! We often make frittatas as it is a great way to use up leftovers that have been sitting in the refrigerator. 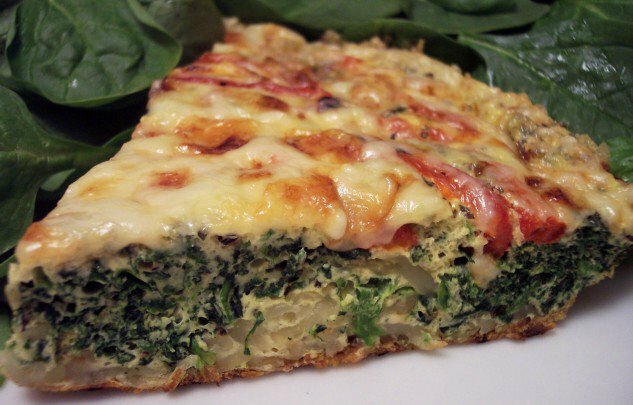 Dinner tonight, a Florentine Frittata, has a crispy hash brown crust topped with a spinach and egg combo then strips of roasted red bell peppers scattered over the top. Before serving, a sprinkling of cheeses is broiled until slightly crisp and melted. 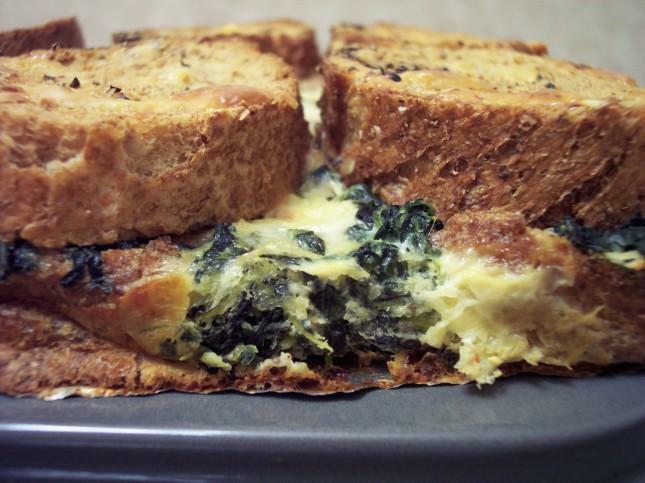 This is a quick meal that could be thrown together in a snap for a great breakfast treat too. Friday being the start of the weekend and Weekend Cat Blogging #21, Miss Kitty decided to make an apperance to wish Kiri from Eat Stuff a Happy First Birthday. 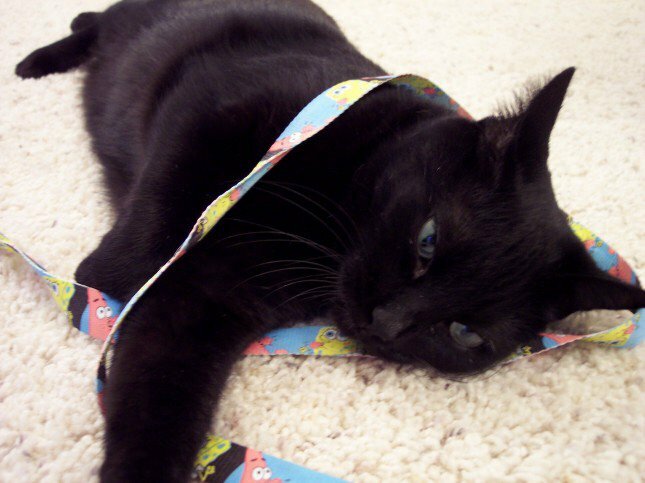 Here she is offering Kiri one of her favorite shoestring toys! Clare hosts WCB every weekend where food bloggers come together and show off their kitties! Stop on over and see the cutie in a tie! These cookies caught my eye while I was flipping through a cookie book, as it seemed like an unusual combination of ingredients. Cornmeal Maple Walnut Twists can be described as being crunchy yet somewhat chewy and almost slightly sticky while you eat them. A sweet coating of confectioners' sugar gives a nice powdery snow-like finish. I have used cornmeal before in baking but I don't think I have used it in cookies and the texture with these is very good! 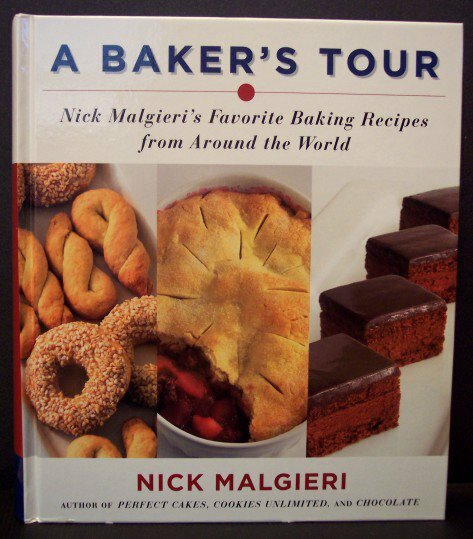 The author used pecans originally, but I don't always have them on hand so I used walnuts instead. Tofu is something I never thought we would ever use. Until we tried it for the first time, I was pretty turned off by the look of it. 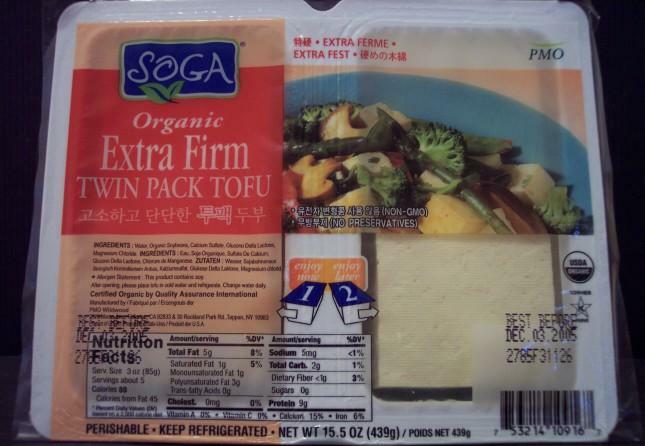 When we found out it was not all that bad, we could actually use it and like it, I have been looking for recipes with tofu as a predominate ingredient. 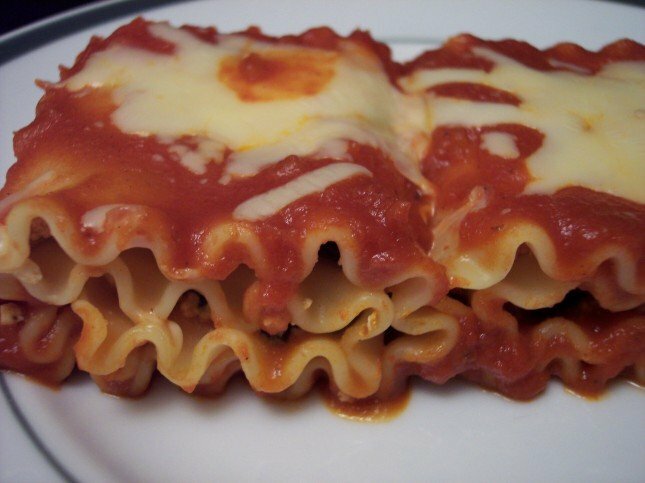 Lasagna Rolls are something we have had before, but it always included some sort of meat. When I found this specific recipe I set it aside and thought "yeah if I ever get around to it..." Since I decided we needed to give tofu another try I bought some at Trader Joes this week for this recipe. This turned out to be a great vegetarian meal for us. 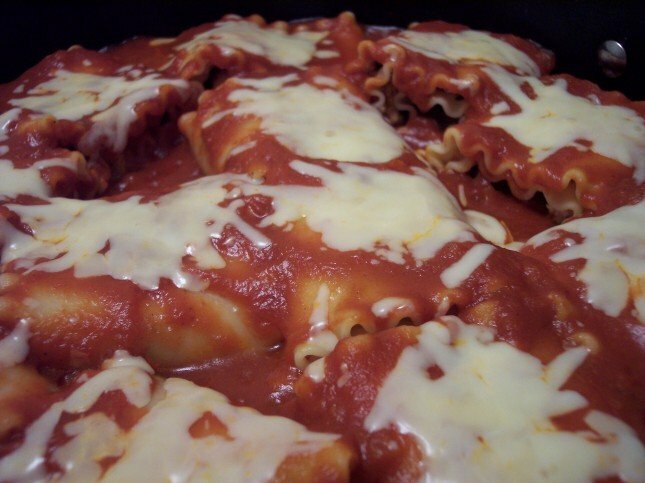 Tender al dente lasagna noodles wrapped around a filling of tofu, spinach, cheese and garlic. I found this to be very filling, serving a simple green salad along side. This did make quite a bit, but I'm really looking forward to having this for lunch tomorrow. The cookie report is in.... The tassies that we made yesterday went over well with the office mates. I think these will definetly be added to our holiday gifts this year! We have made a tabbouleh dish before that we liked so I figured we would give it another go. 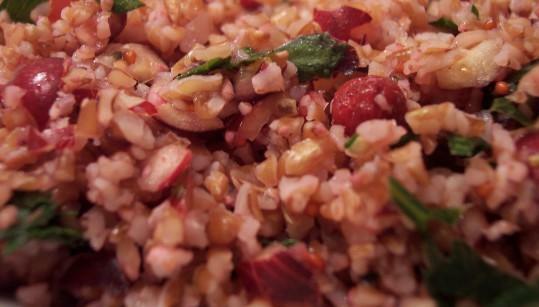 I like working with bulgur as it is pretty fool proof and can be set aside while you are working on other things. Cranberry Walnut Tabbouleh originally called for dried cranberries, but since we still had some fresh in the fridge I decided to use them up. I chopped them in the food processor (so easy!) and this gave the dish a slight pink color. I was afraid that it might make the dish too tart but I think with the rest of the ingredients the flavors all mixed well and it fit right in. 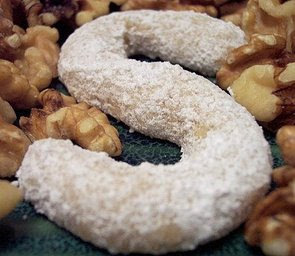 If you can find it, definetly use walnut oil as it boosts the nutty flavor. Lemon juice gives this a fresh taste and the small amount of mint lends a cool flavor. 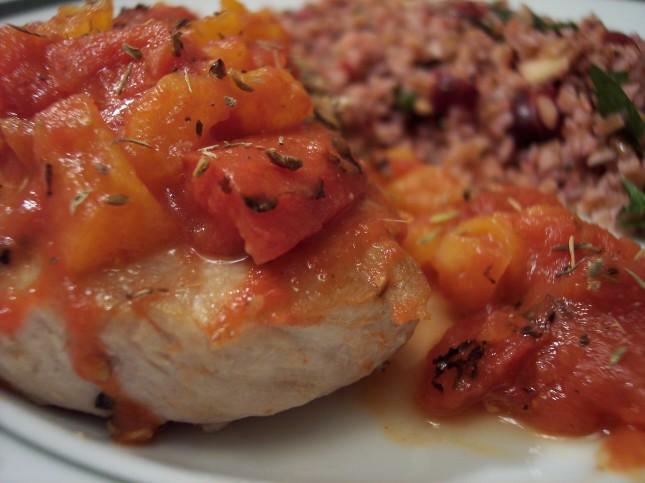 Having the above as a side, I made Pork Chops with Apricot-Tomato Chutney for the main part of the meal. Searing the pork and then baking helps ensure that the inside is very tender and juicy. A thick chutney is served on top, made from fire-roasted tomatoes and dried apricots. The apricots plump up a little from the juice in the tomatoes and the heat from crushed red pepper add to the unique taste. It's Tuesday... you know what that means if you have visited long enough! Today is when I make treats for Jeff to bring into the office on Wednesdays. The recipe I made today was a little labor intensive, but overall it went smoothly. 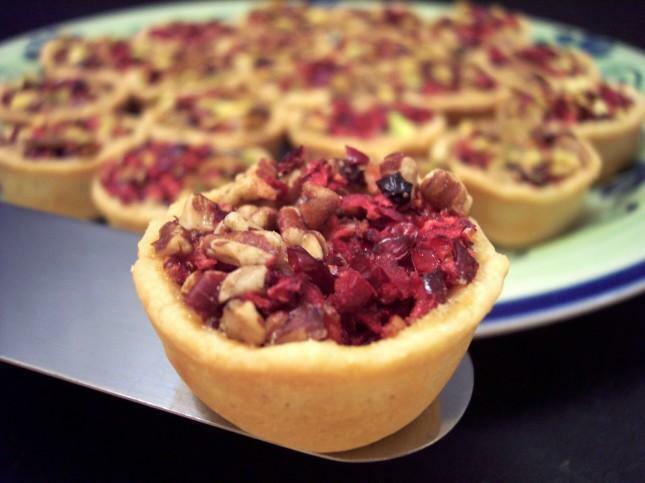 Fresh Cranberry-Pecan/Pistachio Tassies are fun little cookies/tarts that have a brown sugar filling and are then topped with fresh cranberries and nuts. I made 2 kinds - each has cranberries and then half have pecans while the other has pistachios. They are made with a cream cheese dough that was very easy to work with. 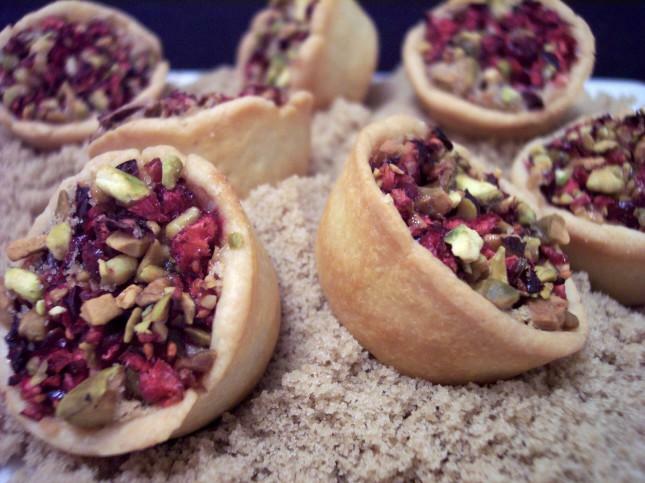 You could fill these little pastry cups with a variety of fillings from lemon curd to brownie batters or even a pumpkin filling. Definite repeater for the upcoming holiday season. Another soup night for dinner. This one is a little different and is Greek-inspired. 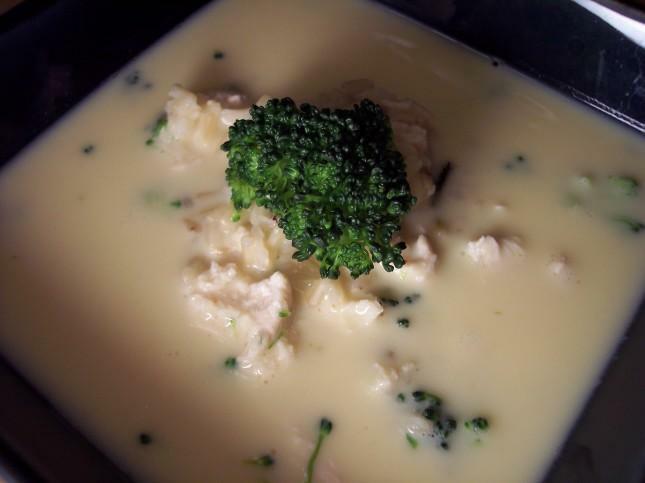 Broccoli, Egg, and Lemon Soup with Chicken is a rich and creamy dish that uses a bunch of leftover ingredients to make this a comforting soup. You could change around the amounts or use different vegetables and meat and I'm sure this would still be a great meal! 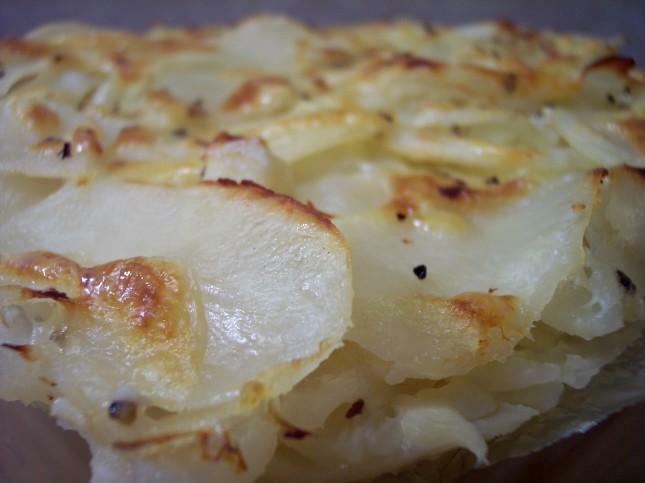 I was looking to use up some potatoes and I was wanting to keep the comforting theme going so I made a Scalloped potato dish. 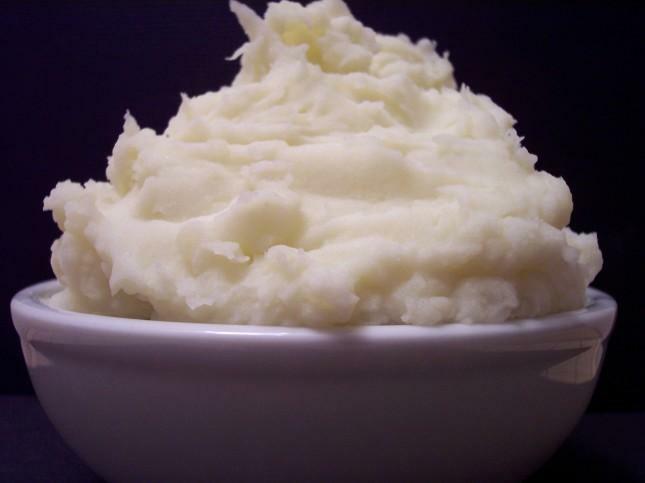 This can be thrown together in a few minutes after prepping the potatoes. The tender creamy potatoes and layers of cheese meld into gooey squares with a crispy topping. Since we had some more pumpkin to use up and I knew I was going to be making soup tonight, I wanted to find a fun and different bread to make. I came across this recipe last month and pulled it out of the recipe pile to try. Pumpkin-Walnut Focaccia with Gruyère takes a bit of time to make as it requires 3 different rises but makes plenty so you can freeze the other loaf. This bread was so worth the effort. This is not your traditional foccacia/flatbread type with dimples. I think the recipe name is a little misleading. 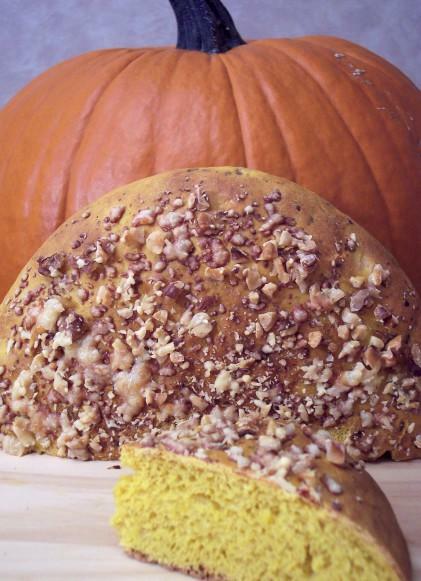 It has a sweet subtle pumpkin flavor while being slightly chewy and dense. Next time I would increase the cheese amount, I could tell it was there but it could take on more flavor without overpowering the bread. Recapping this past week we made 12 new recipes. If your looking for any of the recipes make sure you take a peek at the left side bar to find them! I update every Sunday with the past week's recipes. You may need to hit refresh to see the additions. The collection is growing pretty big! This morning was busy as we had to get some stuff done outside before we went grocery shopping. I got the menu for this week done last night and prepared the grocery list. I noticed that *someone* was glancing over what was on it and then commenced the rolling of the eyes as tofu (insert evil laugh here) was spotted. We have used it once before and it turned out very good so this will be round 2! 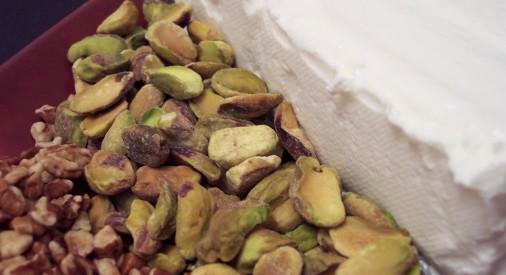 Cream Cheese, Pistachios and Pecans... I'm looking forward to this one! So Max is here waiting for me to post our entry for the Weekend Dog Blogging #6 that Sweetnicks recaps every Sunday night. This was taken yesterday while he was playing with one of his favorite toys. 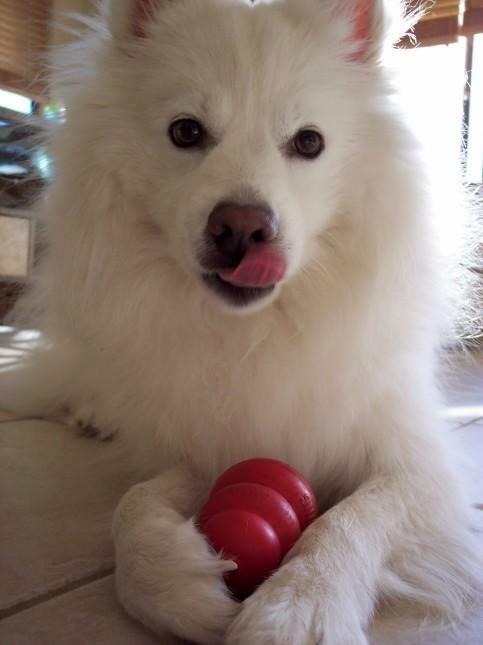 He's waiting to lick the toy to death as we put just a little peanut butter inside. Our Netflix movie of the night will be Cheaper by the Dozen with Steve Martin and Bonnie Hunt. Stay tuned to see what's brewin' in our kitchen this week! Everytime we pass a bakery shop, we keep seeing scones and I have been wanting to try to make some so we can see what they are like. I have never had one before (as far as I know) so I am not sure how these compare to "real" scones as they are of a lighter kind. Since we still had some fresh cranberries in the refrigerator I figured it would be a great way to get started! The dough itself was a little more sticky than I thought it would be, but I find that happens with cooking light bread type recipes. I thought about adding a little more flour, but I did not want to toughen the dough. I figured I might as well press on and just use a little cooking spray on my hands to keep things moving. That worked well and before I placed it in the oven I sprinkled about a tablespoon of raw crystal sugar on top for a little crunch. The inside was light, moist and soft while the golden exterior was nice and crunchy. I tried this warm this morning and then had a snack with one toasted later. Both were very good, but I think warm out of the oven was the best. I can't wait to make more of these! Tonight our movie from Netflix is I, Robot with Will Smith. Check back tomorrow for the recipe recap from this past week! It has been a busy one in the kitchen! Soft or Crispy - what do you prefer? I was not planning on doing any baking today, but yesterday there was some bad news that was given out at Jeff's office. I wanted to make something for them that was comforting but I didn't have time to go shopping so I had to have everything on hand already. I looked though the pantry and saw I had the staples for chocolate chip cookies. I remembered we had made some before for them that were soft and chewy so this time we went with the more crisp kind. I changed my schedule and got up a little earlier than normal so I could get going on them. After they were done and slightly cooled off I did have to try one before sending them all off. The texture of these golden brown goodies are crisp, slightly chewy and packed with chocolate chips. I think I prefer these over ones I have had in the past as they seem to appeal to more people than the softer kind. Don't get me wrong though... 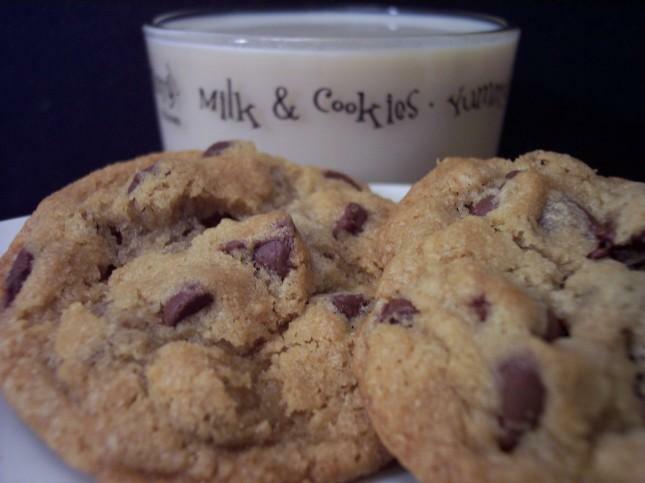 I don't think any kind of chocolate chip cookie could be bad! So what kind do you prefer? Going into a different realm for dinner tonight. Curried Chicken with Fresh and Dried Cranberries served over brown basmati rice has so many textures and flavors going on. 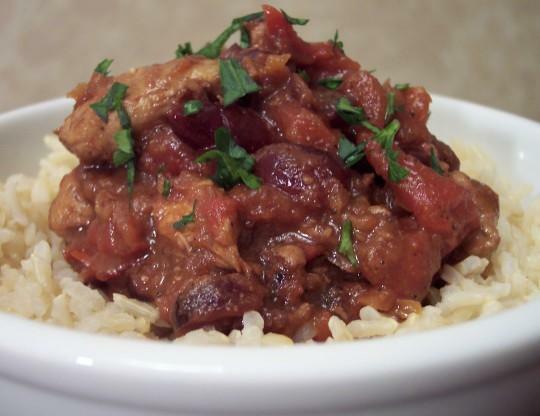 This is a hearty chicken stew type dish that has a spicy background if you use a medium or hot curry powder. I used Muir Glen fire roasted tomatoes and then added some green chiles in separatley. 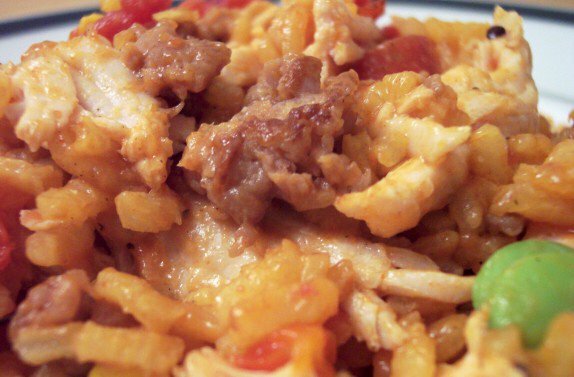 This can be made ahead of time and then reheated for a quick dinner. 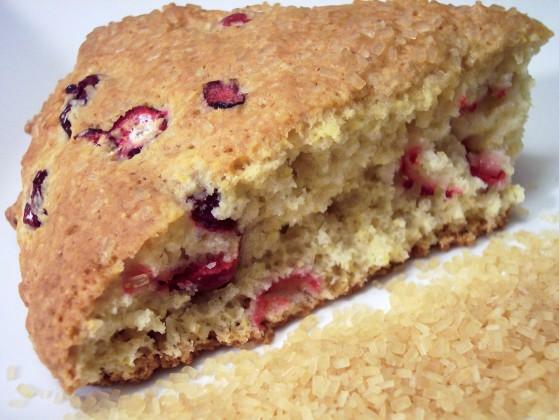 Another great way to use up the fresh cranberries! 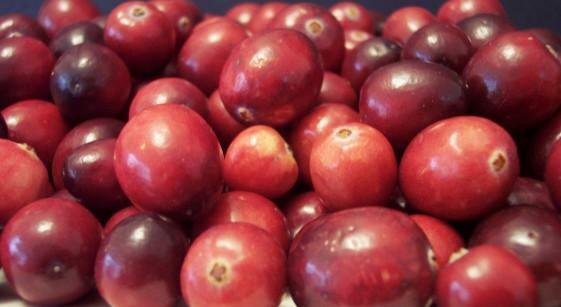 Happy to see that fresh cranberries had finally arrived in our area it was time to make something with them! 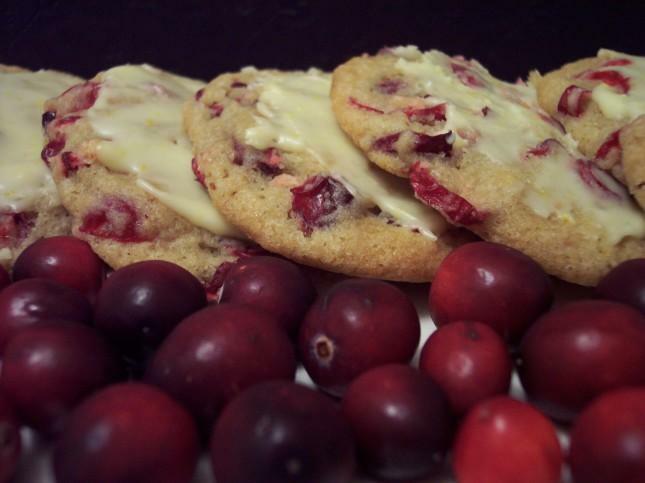 I had a couple ideas already and went with Fresh Cranberry and Orange Cookies. These are a soft and chewy cookie that is lightly coated in an orange frosting to help cut the tartness of these berries. Having both orange juice/zest in the cookie dough and frosting brings a bright and subtle flavor and does not overpower the rest of the flavors. I chopped the cranberries by hand but you could easily use a food processor to do the work for you - just leave some bigger chunks. After enjoying my cookie sample it was time to head off to start dinner. 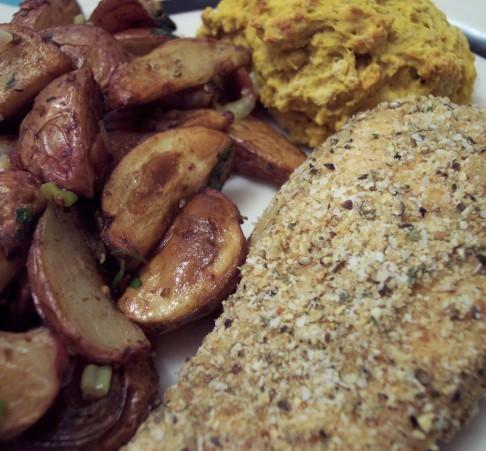 I made Sweet and Crunchy Mustard Chicken with Roasted Potato Salad and the Pumpkin Biscuits from earlier in the week. The tender chicken breasts remain juicy but still have a nice crunch from being baked instead of fried in the oven. Tangy dijon mustard and brown sugar in the coating brings a unique depth of flavor to the chicken. The potato salad was pretty quick to throw together after being in the oven. There was just enough vinaigrette to coat the potatoes without making them soggy. I got a look like I was destroying it when I threw the roasted potatoes in a bowl with green onions, bacon, parsely and the dressing. Thankfully, everything melded well and got the thumbs up on the salad! I really liked this one. The M&M cookie bars went over well at Jeff's office from what I hear. None of them came home so that must be a good sign! Tonight for dinner we had Bread Pudding Florentine. While I was putting this together this morning I was a little nervous with how it was going to come out. I was thinking it would be better to just cube the bread and mix everything together, but in the end I'm glad I layered it. The bottom layer of bread is not overly soggy as it sometimes can be while the top layer has a nice crispness. The inside of the top slices are still a little soft from the egg mixture. 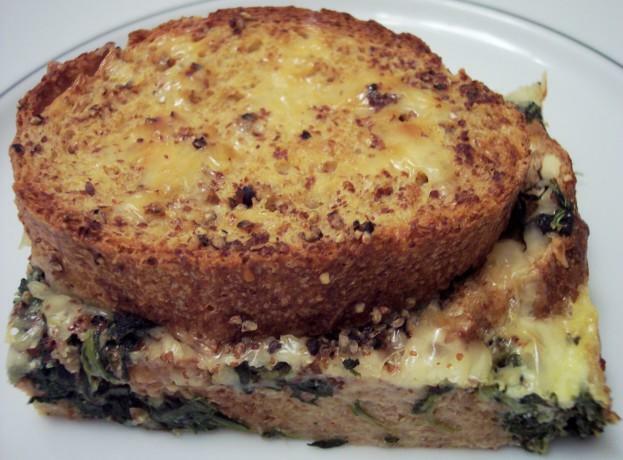 The spinach layer brings both textures together and lends its flavor throughout the dish. It may be cool outside... but inside with dinner it was hot hot hot! I spied some halloween M&M's in the store on Sunday and picked up a bag knowing I had something already in mind for them. Being Tuesday, I had to come up with something for Jeff to bring into the office tomorrow for treat day so out came the M&M's. I decided we would try M&M Cookie Bars. These came together pretty easy and since you don't need to shape anything it went by fast too! 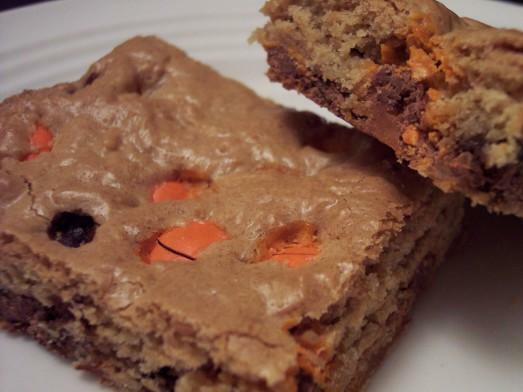 These chewy bars are just like a slightly crispy yet still soft inside chocolate chip cookie. Well, if it had chocolate chips in it! I did brown the butter a little when I melted it to bring out a depth of flavor that adds to its uniqueness. 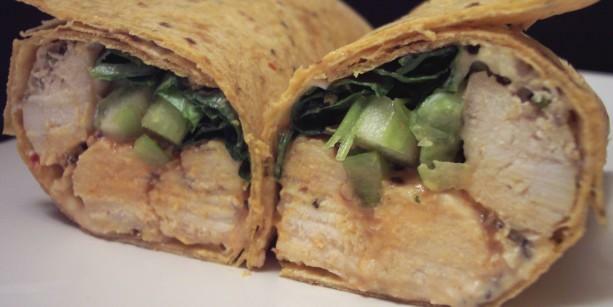 Spicy Buffalo Chicken Wraps were on the menu for dinner. Juicy chicken tenders dipped in a spicy hot sauce and mixed with a cool blue cheese dressing all wrapped in a chipotle tortilla. 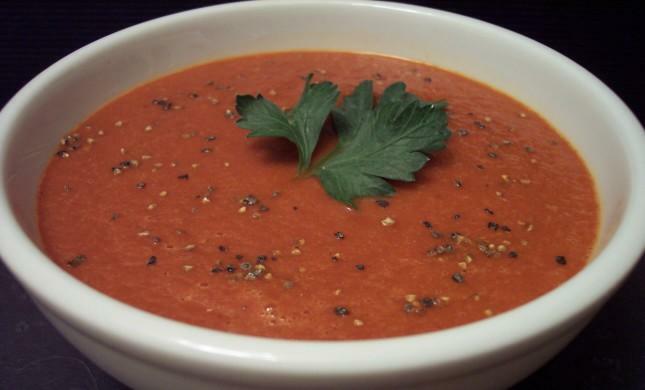 The tangy dressing has just enough flavor to help calm down the heat. Eating them was a little messy as it does drip but it was oh so good and hot! 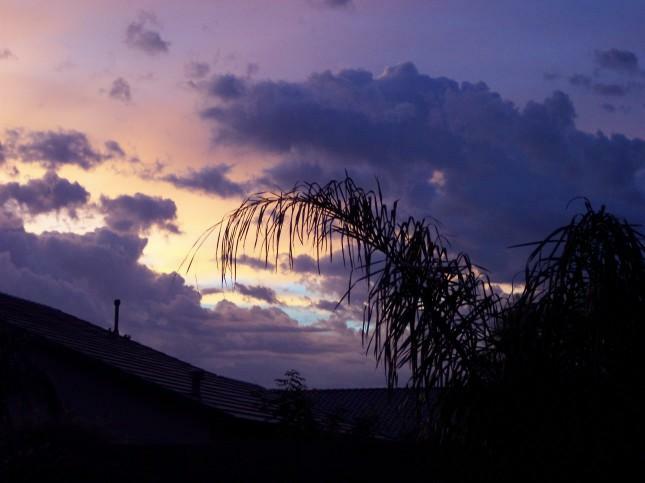 It was a cloudy and mild day with a scattering of raindrops and rainbows. I think I saw at least 4 rainbows throughout the day! The temperature was around 85 and it is suppose to drop to the mid 70's for the next couple days. The AC is off and the windows are open. It finally is starting to feel like fall outside! We have 3 recipes to get to from dinner tonight. 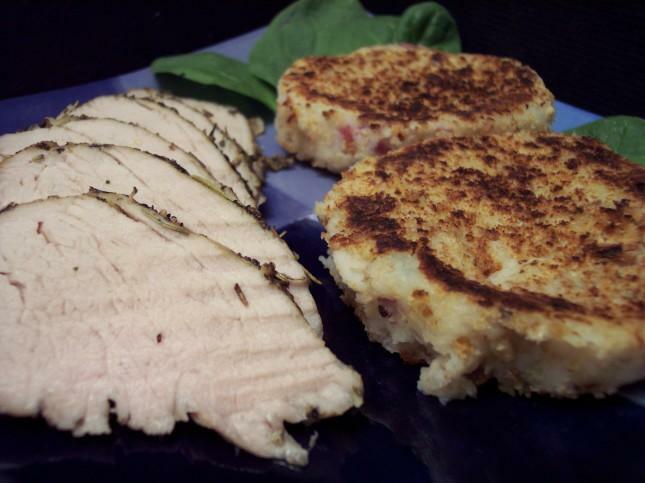 I put together Herb-Coated Pork Tenderloin, Walnut-Crusted Potato and Blue Cheese Cakes, and Pumpkin Drop Biscuits. Even though it may sound like a lot - most of the prep work can be done early and most of the time tonight was just spent waiting around for the stuff to cook! 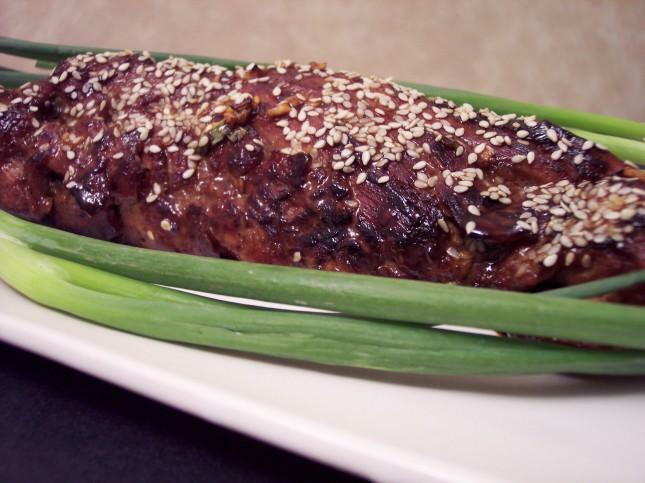 The Pork Tenderloin is coated in a variety of fresh herbs with olive oil and marinated overnight. It was juicy with just a slight pink in the middle. The fresh herbs brought an extra punch which flowed throughout the tenderloin. While the pork was resting I went to cooking the potato cakes. I was a little worried that these might not hold together, but it went well and had a nice crunchy exterior and a warm creamy center. The blue cheese gave off a subtle tang and went well with the nutty coating. 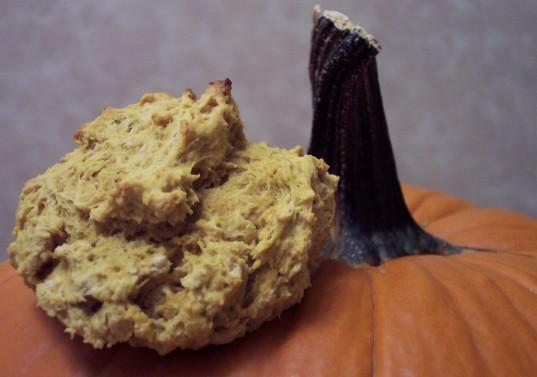 I had more pumpkin to get used up so I found a biscuit recipe that sounded good. The orginial one called for them to be rolled out but I am fond of drop biscuits so I changed it a bit. I'm glad I did as it was a little too sticky to roll out and I would have had to use too much flour to try to. This way was faster and easier to deal with! The pumpkin taste is not overly pronounced but you can tell it is there. They are light biscuit reminiscent of fall flavors. Busy day today! Went grocery shopping early so we could hit a couple different stores looking for specific ingredients. I went through the recipe binders and cookbooks to pick out new ones last night and looking at the stack now it should be another busy week! I was very happy to see it is finally time for fresh cranberries! I mentioned earlier that I needed some but could not find any (fresh or frozen!) After hitting the stores today I found them to be quite abundant! I think at least 3 recipes this week include them. 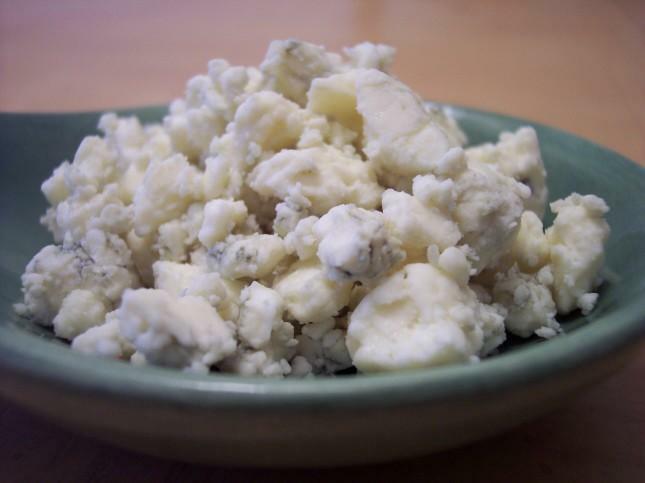 Another great item we will be using at least a couple times is a crumbly, tangy, and sharp blue cheese. The movie last night from Netflix was awesome! Great movie! Tonight they bring us A Lot Like Love with Ashton Kutcher and Amanda Peet. I don't have high hopes for this one, but who knows! Before I forget, make sure to TiVO or watch FoodTV tonight. They are showing the Cupcake Challenge which we attended. I'm not sure when they are showing the Chocolate Fantasy that we were also at. They held these a few months ago in Phoenix. Here's a glimpse of a piece from one. Another busy week has passed with 11 new recipes being made. Even though we end up making quite a few new recipes each week the pile of untried recipes just does not go down. I need to stop adding to it... but that's no fun! The pumpkin bars from yesterday have been calling to me all day. The right about of spice and pumpkin flavor went so well with the cream cheese frosting... it is hard to keep my hands out of them! Since it is the weekend, I suppose we should get our picture of one doggy to join in the fun over at Sweetnicks for Weekend Dog Blogging #5. If you would like more information about it - Sweetnicks should have the round up posted sometime tomorrow! 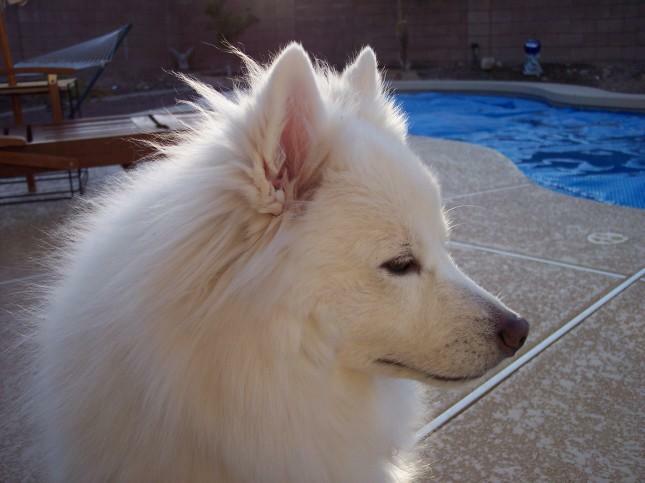 We caught Max sitting out by the pool early this morning trying to relax before the temperature went to warm for him. DVD's arrived from Netflix today (cutting it close I say!) so tonight's flick will be Sin City starring Bruce Willis and Jessica Alba. Don't forget to check out the recipe section in the left hand collum. I update every sunday night with the previous weeks recipes. Each one has a picture to go with it! Since I still had some leftover mashed pumpkin from last Friday I went looking for a bar type recipe and the KA Cookie Companion came through again. 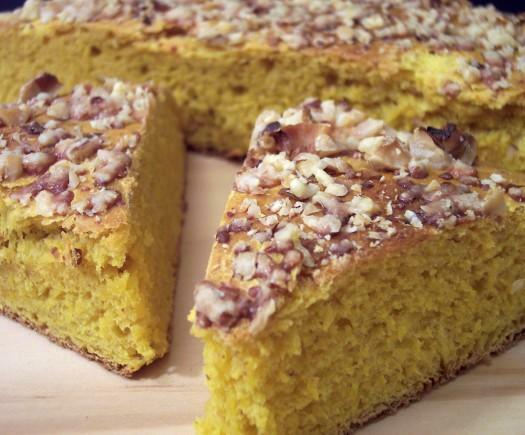 Harvest Pumpkin Bars keep that classic pumpkin orange color after baking. They are very moist, dense, and have a generous layer of a delicious cream cheese frosting. 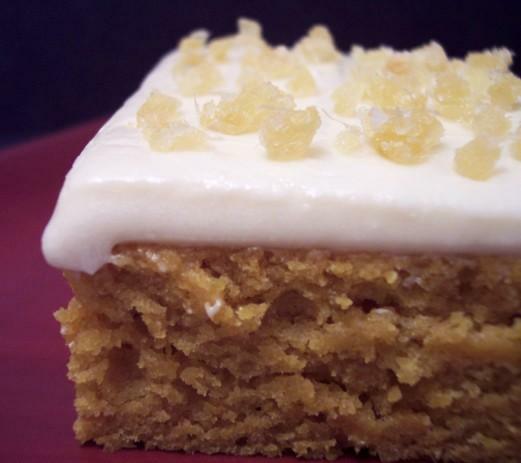 To make the frosting a little more interesting I finely diced crystallized ginger to sprinkle on top. These are pretty addiciting! 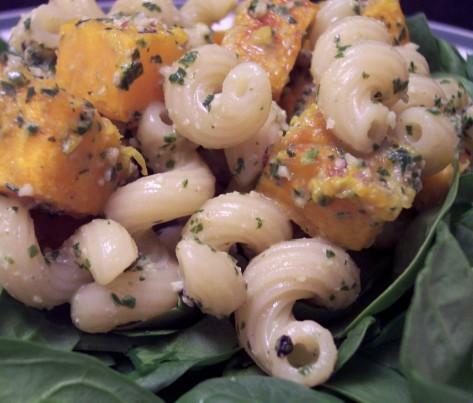 Cavatappi Pasta Salad with Walnut-Sage Pesto was on tap for dinner tonight. I love this grooved spiral pasta. Roasting the butternut squash helps bring out a little sweetness and gives the outside a nice caramalized finish. The pesto is pretty light with only 2 tablepoons oil and the rest of the liquid coming from chicken broth. I liked how the majority of the pesto was parsley and sage as we tend to have a lot of that around. The orginial recipe called for torn Arugla, but we prefer Spinach so that is what I used. Overall this was a nice and light dish where the suggested servings were actually a nice size! 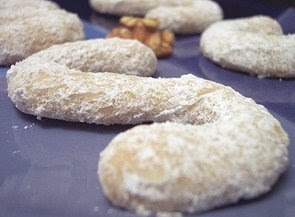 Biscotti.... these crunchy little cookies can be made into so many different tasty treats. The version I made today is an Italian type as there is no butter in the recipe. These are more on the dry side and usually do not have a lot of extra stuff mixed in. They are denser and have more crunch than an American style where the dough is softer and able to accept more mix-ins. 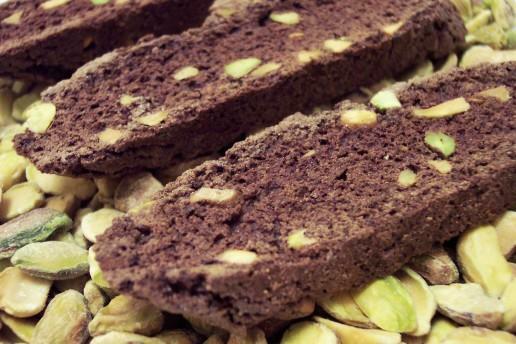 Double Chocolate Pistachio Biscotti have a very deep and rich chocolate flavor from dutch cocoa with melted unsweetend chocolate mixed in. 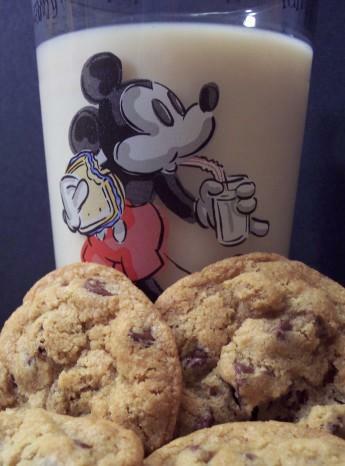 These would be great little cookies to dip into your favorite coffee drink. 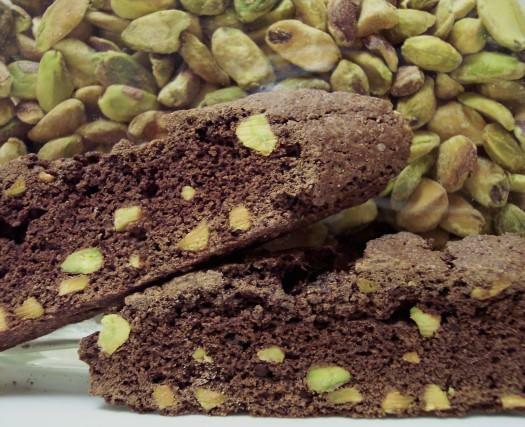 The Pistachios bring a slightly nutty essence and visual interest to the biscotti. Dinner tonight was Honey-Hoisin Pork Tenderloin with Wasabi Mashed Potatoes . The ingredients of each dish went together so well and had many different flavors going on. The pork was slightly sweet and had a nice depth of flavor from the sage honey. I did have a tough time finding the honey but finally found some yesterday. I was just going to go with regular desert honey but wanted to see if I could find what was suggested in the recipe. I'm glad I did! The Wasabi potatoes kept me waiting for a kick of heat, but I think it could use another 1/2 teaspoon or so. I did increase from what CL suggested but even so I think there was a lot of potatoes to try and flavor. I like that the only added liquid to mash them was the low-fat yogurt which kept them creamy and quite fluffy without going gummy. I really don't like gummy mashed potatoes. They do take on a very very slight green hue from the Wasabi powder. As I was saying yesterday, I had made something that was waiting for me in the refrigerator to finish this morning. 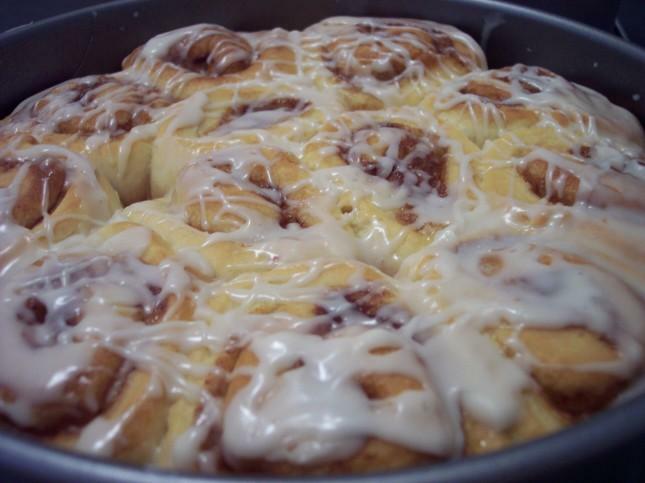 Old-Fashioned Cinnamon Rolls were slowly rising over night in the chilly air so I could bake them off early. I wanted them to be fresh and still warm from the oven when Jeff brought them in. After a quick 30 minutes of being in the warm air they started to begin their final rise and minutes after being in the oven the sweet cinnamon scent went throughout our house. I very impatiently waited by the oven door so they didn't over bake. It was hard to resist the urge to open the door and peak in but at least I could cheat and see through the glass window with the oven light on. The buzzer went off, the glaze was mixed up and out they came to cool off slightly. I drizzled the sweet vanilla glaze and watched it slowly melt into the cracks and crevices of the very tender dough. To keep them warm I wrapped each pan with tin foil and sent them on their way. I hope they were as good as they smelled! And for anyone wondering I did hear back and they went over well! 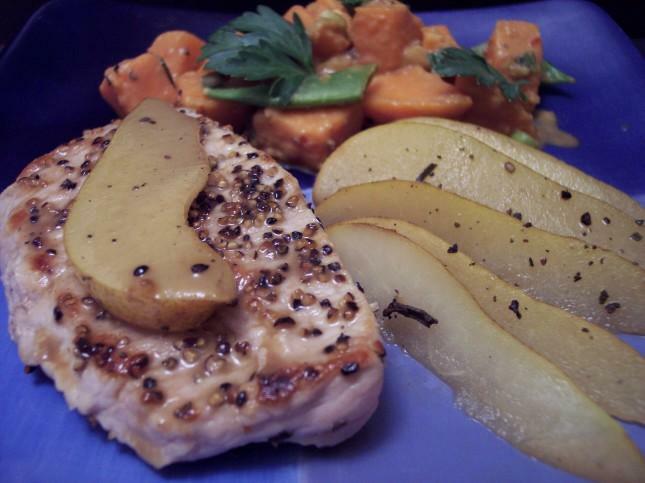 On to dinner... We had Peppered Pork and Pears served with a Sweet-Potato Salad with Spicy Peanut Dressing. I really enjoyed the pork/bartlett pear combination. I used pears that were just still firm and not overly ripe. The quick sauce that goes along top went very well and gave just enough extra juice to swirl the pork in. The sweet-potato salad lived up to its name and was pretty darn spicy! While eating, I thought I could have handled a little more heat but thinking back it was just right. Some peanuts at the end helped add a little crunch and interest to the tender potatoes. The sauce had just enough peanut butter taste to bring the sweetness in the potatoes down and unlike some past recipes I think the sauce amount was pretty generous.